Don’t let the name of this plan fool you, although it says “Advanced” it is even simpler to use than our Basic Plan. Why? 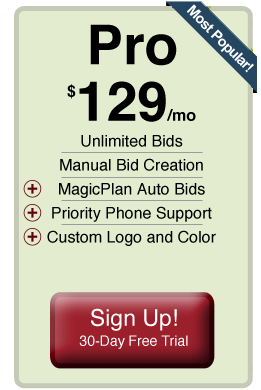 Our partnership with MagicPlan allows you to instantly create floor plans and then push those plans to BidRazor. Once the plans are transferred you're off to the races by doing minor tweaks to make your bid perfect. Just like our Basic Plan, the Advanced Plan allows you to initially put in your own parameters so when you go to a job site all you have to do is push the plan from your MagicPlan App to BidRazor.